Reporting Objects are stored in folders in the tree within domain folders under the Content folder. They can include selection criteria (WHEREs), JOINs, virtual fields (DEFINEs), filters, and other WebFOCUS statements, as well as reports or charts supplied as templates. Note: A Reporting Object will not be listed in the tree when the user cannot functionally use the Reporting Object. The browser Reporting Object tool allows you to create, edit, test, run, or delete a Reporting Object or its components. 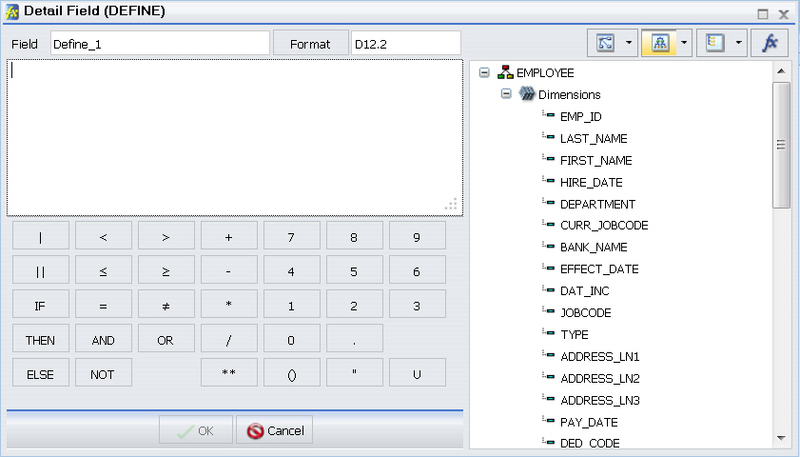 The main interface, as shown in the following image, consists of a static Quick Launch toolbar, a ribbon of context-sensitive options, and a window that displays the components of the Reporting Object with which you are working. The Reporting Object tool Quick Launch toolbar is a static menu whose commands apply to the entire Reporting Object, not simply to the particular component that you have selected. The following table describes each command in the Reporting Object tool Quick Launch toolbar. Launches a menu allowing you to Save, Save As, Run, and Exit. Displays Reporting Object code in a read-only window. The Reporting Object tool ribbon is a menu whose commands apply to what you have selected, whether that is the Reporting Object as a whole, a particular component, or an individual example of a component. For example, a particular filter or filter group, if you have selected one, rather than selecting the entire Filter component. The following table describes each command on the Reporting Object tool ribbon. Creates a new join, DEFINE statement, filter, or WHERE statement. Launches InfoAssist to create or edit a report or chart, or launches the appropriate tool to create or edit a join, DEFINE statement, filter, or WHERE statement. Opens component source code in the text editor. Renames the selected filter or filter group. Deletes all items of the type selected, for example, all WHERE statements, all filters in a particular group, or all filters in every group if the Filter component itself is selected. Prompt for Parameters. Enables amper auto-prompting. Auto Create My Content Folders. Creates My Content folders for users with the My Content Folder privilege so the user has a place to save their private content, such as procedures they may create using InfoAssist or report output they save from the Deferred Status interface. For more information on My Content folders, see the WebFOCUS Security and Administration manual. Authorized users can view or edit the access rules, effective policy, or sharing permissions by clicking Security. The Server Properties tab, shown in the following image, allows you to manage the server and application path settings. 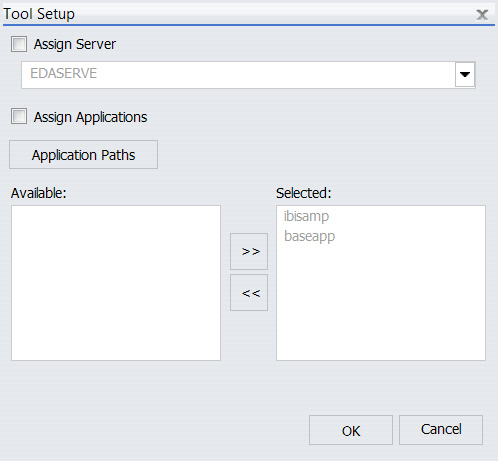 To change the server, check Assign Server and select one of the available servers. Move application paths from the Available box to the Selected box by double-clicking them or by selecting them and using the movement arrows. Use the up and down arrows to change the preferred order of the application paths. The Details tab, shown in the following image, allows you to see the Master Files, data elements, sorts, conditions, expressions, output formats, and joins used by the Reporting Object. The Advanced tab, which is shown in the following image, allows you to set default height and width values for the item, when it is displayed inside a portal at run time. Open the browser and navigate to the folder that will contain the Reporting Object. If the folder that will contain the Reporting Object already exists, proceed to step 4. Otherwise, create the folder by right-clicking an existing folder in the tree and selecting New, then Folder. Alternatively, right-click Content and select New Folder to create the folder directly under the root. The New Folder dialog box opens. 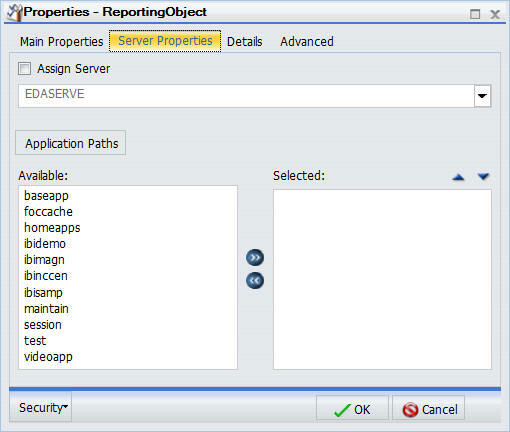 Type the name of the Reporting Objects folder, optionally select a server and an application path, and click Create. If you do not select a server or an application path, each is set to the default server and application paths for your WebFOCUS installation. For more information, see the Managed Reporting manual. Right-click the folder that will contain the Reporting Object, and select New, then Reporting Object. The Tool Setup dialog box opens, as shown in the following image. Click OK to accept the default settings for the server and application path, or change the settings and click OK to proceed. The Open dialog box opens, prompting you to select a Master File, as shown in the following image. Select a Master File and click OK. The Reporting Object tool appears. Right-click the Reporting Object and select Edit. Note: Double-clicking the Reporting Object runs the Reporting Object rather than allowing you to edit it. Press Ctrl+S or click the Save icon on the Quick Launch toolbar. Type the name of the new Reporting Object in the Title field and click OK.
From now on, clicking Save or pressing Ctrl+S saves the Reporting Object without launching the Save dialog box. 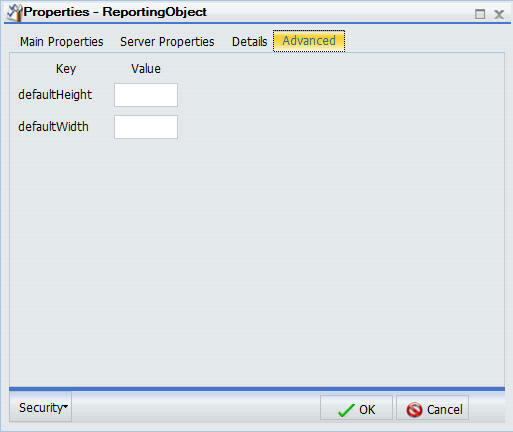 Select the object in the Reporting Object tool and click Run, or right-click the object and select Run. Right-click the Reporting Object in the tree and select Run or Run Deferred. The Run option in the Reporting Object tool is enabled regardless of the setting of the Only Run as a Deferred Report property. When you define a Report or Chart component, all components of the Reporting Object run. When you define a Report and Chart component, an HTML page opens, which enables you to select which component to run. When you define filters in a Reporting Object, an HTML page opens, which enables you to select from the defined filters of the Reporting Object. When you define parameters in a report or chart and the Reporting Object Prompt for Parameters property is specified, an HTML page opens, which prompts you for parameter values. Reporting Object components are validated prior to run time. This means that errors are found and corrected more easily, since errors in individual components are detected prior to run time. Users using the Reporting Object to create a report do not see the DEFINE statements, WHERE statements, or JOIN commands defined in the Reporting Object, which are issued automatically every time a user accesses the Reporting Object. However, the report or chart components, including headers, footers, and styling features, are visible to authorized users who can use them to create their own customized report. The filters defined in the Filter component are applied only if the user of the Reporting Object activates them when the report or chart based on the Reporting Object is run. The Preprocessing Other component contains custom code that must run before all other components. You can use the text editor in the component to create and edit code or to paste the code that you have copied from another application. Select the component and click Edit on the ribbon. Right-click the component and select Edit. The Preprocessing Other text editor appears. See the Creating Reports With WebFOCUS Language manual for more information about using the WebFOCUS language to code procedures. Syntax and error checking is not performed on the commands that you type until the Reporting Object is run. When using Amper Auto prompting, users may be prompted to supply amper variable values for parameters that the private user content does not reference. These scenarios are directly related to the internal processing of reports created using a Reporting Object. Whether a user is prompted by the Amper Auto prompting facility for amper variables assigned a default value using the –DEFAULT command is dependent on the setting of the WebFOCUS Client configuration parameter, IBIMR_prompting. When IBIMR_prompting is set to XMLPROMPT, users are prompted for amper variable values, and default values are displayed in fields in which the default values have been specified. When IBIMR_prompting is set to XMLRUN, users are not prompted for values when all amper variables have been assigned a default value. For more information on setting the IBIMR_prompting parameter, see the WebFOCUS Security and Administration manual. Suppose that your company has a data warehouse and you need a Reporting Object that uses an extract from that data warehouse. In your Preprocessing Other component, you create a HOLD file from the data warehouse, and then you use that HOLD file in each Reporting Object component. You can clear the JOIN command and delete the HOLD file in the Postprocessing Other component so that it is not mistakenly used again the next time that the Reporting Object is used. Clear the JOIN command and delete the HOLD file in the Postprocessing Other component. Run the Reporting Object, and then view the object source to verify that the output is correct. Verify that the HOLD file does not exist in the location in which it was created. 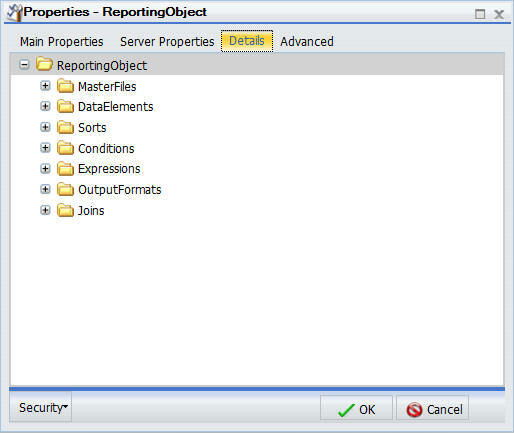 For more information on creating a Reporting Object, see Properties of a Reporting Object. Select the Preprocessing Other component and click Edit. Click Save, and then close the text editor. To verify that the component works properly, select the Preprocessing Other component and click Run. Select the Join component and click New. The Join component is prefilled with the EMPLOYEE table. Click Add New, select the WINFILE table, and click OK.
Click the Add New button, select the JOBFILE table, and click OK.
Click OK to close the Join tool, saving your changes. Click View Code in the Reporting Object Quick Launch toolbar to review the code. Drag NEWCURR_SAL from the Measures in the Data box to the canvas, and select Drop as sum. Drag EMP_ID from the Dimensions in the Data box to the left of the NEWCURR_SAL column in the canvas, and select Drop as sort. Drag NEWHIRE_DATE from the Dimensions in the Data box to the left of the NEWCURR_SAL column in the canvas, and select Drop as sort. Drag NEWDEP from the Dimensions in the Data box to the left of the NEWCURR_SAL column in the canvas, and select Drop as sort. The report is displayed as a table with four columns, sorted by EMP_ID. Save the report and exit InfoAssist. To verify that the component works properly, click Run on the Quick Launch toolbar. The report that you created in InfoAssist is displayed in the browser. Select the Postprocessing Other component and click Edit. Click Save, and then click Exit. 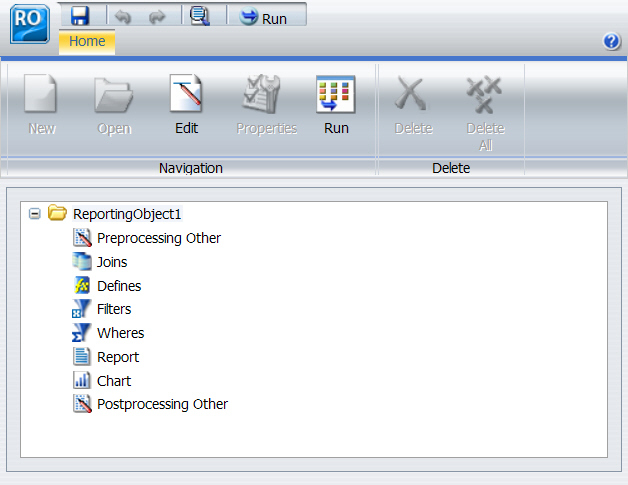 To verify that the Reporting Object works properly, click Run on the Quick Launch toolbar. A join is a temporary connection between two or more data sources that share at least one common field. After you join two data sources, each time that WebFOCUS retrieves a record from the first data source (the host file), it also retrieves the matching records from the second data source (the target file). For more information on joining data sources, see the WebFOCUS InfoAssist User’s Manual. 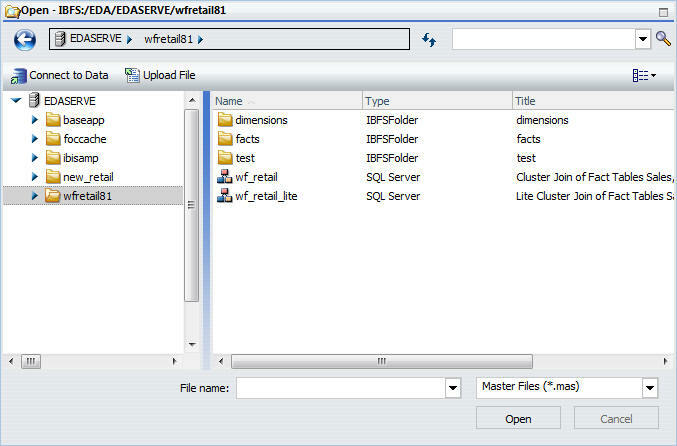 When you join two FOCUS data sources, the target file field must be indexed or the join must be a WHERE-based join. If you attempt to link to a non-indexed target file, the Reporting Object tool offers you the opportunity to create a WHERE-based join. For more information on creating WHERE-based joins, see Join Group in the WebFOCUS InfoAssist User’s Manual . Since every procedure creates a new session on the Reporting Server when it is run, the duration of your connection is always limited to a single procedure. Therefore, any join issued at the beginning of a procedure is in effect only for those report requests that are called in the same procedure. Right-click the Joins component and select New, or select the Join component and click New on the ribbon. The Join tool opens, displaying the data source associated with the Reporting Object. Create a join using the Join tool. For more information on using the Join tool, see Join Group in the WebFOCUS InfoAssist User’s Manual . When you are finished, click OK to return to the Reporting Object tool. To delete a join, right-click the join and select Delete, or select the join and click Delete on the Quick Launch toolbar. In the Join tool, select a join by clicking its connector line, and then click Edit on the Join toolbar. The Edit Join dialog box opens. Type a new description in the Description box and click OK to return to the Join tool. The new description appears under the Join component in the Reporting Object tool. The internal name used for the join remains the same name assigned to the join when you created it. Select the join and click Edit on the ribbon, or right-click the join and select Edit. The join code is displayed in a text editor. Make the desired changes and click Save to return to the Reporting Object tool. To exit without making any changes, click Close. You use the Define tool to create a virtual field. Using this tool, you specify the virtual field name and format, and the expression that defines the field. An expression enables you to combine fields, constants, predefined functions, and operators into an operation that produces a single value. When you define a virtual field, you must specify a field format type, length, and appropriate display options. For more information about defining fields, see Data Tab in the WebFOCUS InfoAssist User’s Manual . Right-click the Defines component and select New, or select the Define component and click New on the ribbon. The Define tool dialog box opens, as shown in the following image. Create a virtual field using the Define tool. For more information about the Define tool, see Data Tab in the WebFOCUS InfoAssist User’s Manual . Click OK to save the virtual field and return to the Reporting Object tool. The virtual field now appears in the field list when a user accesses this Reporting Object. The field list shown in the Define tool is not updated to display new virtual fields until you exit from the Define tool and reopen it. If you are creating a virtual field (DEFINE statement) that uses a previously created virtual field in the expression, you must save the first virtual field before creating the second one. To save the first virtual field, exit from the Define tool by clicking OK. Reopen the Define tool to create the second field. Alternatively, you can type the name of the first virtual field in the expression instead of selecting it from the field list. In this case, you do not need to exit and reopen the Define tool. Since every procedure creates a new session on the Reporting Server when it is run, the duration of your connection is always limited to a single procedure. Therefore, any DEFINE statements issued at the beginning of a procedure are in effect only for those report requests that are called in the same procedure. Existing virtual fields appear under the Defines node, as shown in the following image. Right-click the virtual field that you want to edit and select Open, or select the virtual field and click Open on the ribbon. The Define tool dialog box opens, displaying the selected field. Make changes to the field name, expression, or format, and click OK to return to the Reporting Object tool. Right-click the virtual field that you want to view or edit as text and select Edit, or select the virtual field and click Edit on the ribbon. The Text Editor opens, displaying the selected field. Right-click the virtual field that you want to delete and select Delete, or select the virtual field and click Delete on the ribbon. To delete all virtual fields at once, right-click the Defines component and select Delete All, or select the component and click Delete All on the ribbon. Filters enable users to quickly select predefined criteria that limit the data included in a report or chart. Filters are selection criteria (WHERE statements) that you create for users, who then select the filters needed to limit the data in a report or chart without having to create their own selection criteria. In order to create a filter, you must create the filter group and define the filters that make up the group. Note: The Undo and Redo functions are not available for the Filter component until you have created at least one filter. For more information about filters, see Filter Group in the WebFOCUS InfoAssist User’s Manual . Right-click the Filters component and select New, or select the Filter component and click New on the ribbon. In the Filter Group Name box, type a descriptive name for the filter group folder. Make the filter group name as explicit as possible, because users depend on this name to select the correct filter to apply to their reports. You are returned to the Reporting Object tool. The filter group folder appears below the Filter component node. Right-click the Filter group to which you would like to add a filter and select New, or select the Filter group folder and click New on the Quick Launch toolbar. In the Filter Name box, type a descriptive name for the filter and click Add New if you plan to create multiple filters, or click OK if you plan to create only one filter. Make the filter names as explicit as possible, because users depend on these names to select the correct filter to apply to their reports. The Advanced Filter dialog box opens, as shown in the following image. Use the Advanced Filter dialog box to create the filter. For more information about defining filters, see Data Tab in the WebFOCUS InfoAssist User’s Manual . If you clicked Add new in step 2, the New Filter dialog box opens. If you clicked OK in step 2, you are returned to the Reporting Object tool. Existing filters appear under the Filter group beneath the Filters node, as shown in the following image. Right-click the filter that you want to edit and select Open, or select the filter and click Open on the ribbon. The Advanced Filter dialog box opens, displaying the selected filter. Make your changes and click OK to return to the Reporting Object tool. Right-click the filter or filter group that you want to rename and select Properties, or select the filter or filter group and click Properties on the ribbon. Type the new filter or filter group name in place of the current one and click OK.
Right-click the filter or filter group that you want to delete and select Delete, or select the filter or filter group and click Delete on the ribbon. To delete all filters at once, right-click the Filter component and select Delete All, or select the component and click Delete All on the ribbon. Right-click the filter that you want to view or edit as text and select Edit, or select the filter and click Edit on the ribbon. The text editor opens, displaying the selected filter. When Amper Auto prompting is used (Prompt for Parameters is selected in the Reporting Object properties), there are scenarios in which users are prompted to provide amper variable values in selection criteria (WHERE statements) in the Reporting Object that the user did not save with the report. This is due to the internal processing of reports created from Reporting Objects. You can avoid this issue by using the Filter component to predefine selection criteria for users to include in reports. Only the filter or filters that users select for inclusion in their reports are evaluated by the WebFOCUS Amper Auto prompting facility. WHERE statements or selection criteria, restrict the data retrieved to only those records that meet the conditions that you specify. Filters are selection criteria that run when the user selects the filter in WebFOCUS. Other selection criteria run when the user opens the Reporting Object, preventing data values that do not meet the criteria from being available to the user. For more information on WHERE statements, see Field Tab in the WebFOCUS InfoAssist User’s Manual . Right-click the Where Statements component and select New, or select the component and click New on the ribbon. The New Filter dialog box opens, as shown in the following image. Double-click the red text or press F12 to edit the WHERE statement. For more information on creating selection criteria, see the Filter Group in the WebFOCUS InfoAssist User’s Manual . When you have created the selection criterion, click OK to return to the Reporting Object tool. The Report component creates a report template and saves it in a Reporting Object. Authorized users can use the report template to create a report that suits their needs and then save the new report. To create a report template, double-click the Report component, or right-click the component and select Open. InfoAssist opens, allowing you to create a report template. For more information on using InfoAssist, see the WebFOCUS InfoAssist User’s Manual. To open the report source code in the text editor instead of InfoAssist, right-click the Report component and select Edit. Manual changes to the code may make the report incompatible with InfoAssist. If the Reporting Object contains both a report and a chart, the user is asked whether to run the object as a report or chart. The Reporting Object cannot be run simultaneously as both. When Amper Auto prompting is used (Prompt for Parameters is selected in the Reporting Objects properties), there are scenarios in which users are prompted to provide amper variable values in selection criteria (WHERE statements) in the Reporting Object that the user did not save with the report. This is due to the internal processing of reports created from Reporting Objects. You can avoid this issue by using the Filter component to predefine selection criteria for users to include in reports. Only the filter or filters that users select for inclusion in their reports are evaluated by the WebFOCUS Amper Auto prompting facility. The Chart component works exactly like the Report component. The Chart component creates a chart template and saves it in a Reporting Object. Authorized users can use the chart template to create a chart that suits their needs and then save the new chart. To create a chart template, double-click the Chart component, or right-click the component and select Open. InfoAssist opens, allowing you to create a chart template. To open the chart source code in the text editor instead of InfoAssist, right-click the Chart component and select Edit. Manual changes to the code may make the chart incompatible with InfoAssist. When Amper Auto prompting is used (Prompt for Parameters is selected in the Reporting Object properties), there are scenarios in which users are prompted to provide amper variable values in selection criteria (WHERE statements) in the Reporting Object that the user did not save with the report. This is due to the internal processing of private reports created from Reporting Objects. You can avoid this issue by using the Filter component to predefine selection criteria for users to include in reports. Only the filter or filters that users select for inclusion in their reports are evaluated by the WebFOCUS Amper Auto prompting facility. The Postprocessing Other component contains custom code that must run after all other components. You can use the text editor in the component to create and edit code, or to paste the code that you have copied from another application. To create or edit a Postprocessing Other component, double-click the component, or select the component and click Edit on the ribbon. Alternatively, right-click the component and select Edit. The Postprocessing Other dialog box opens. See the Creating Reports with the WebFOCUS Language manual for more information about using the WebFOCUS language to code procedures. For information on Amper Auto Prompting, see Considerations for Amper Auto Prompting With the Preprocessing and Postprocessing Other Components.